Everyone loves a true original, so it's only fitting that that the very first Sandals is a masterpiece of design. 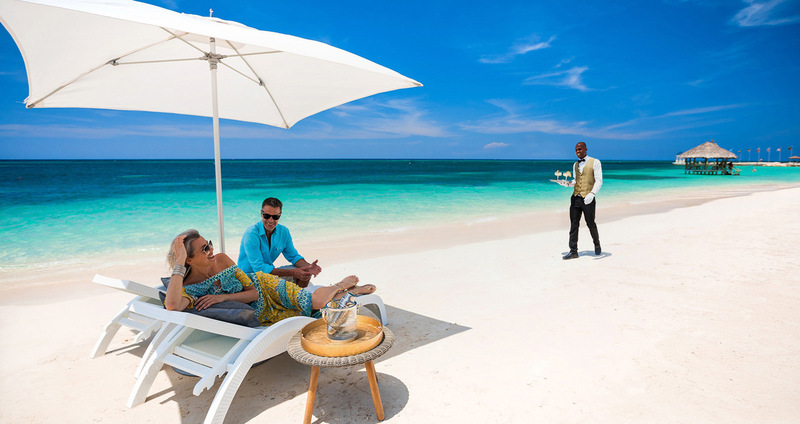 From luxurious suites such as the new Oceanfront Swim-up Suites to the brand new main bar and renovated Oleander Room restaurant, discover the latest amenities and accommodations at Sandals Montego Bay and learn how the true original Sandals Resort is constantly innovating the all-inclusive experience. 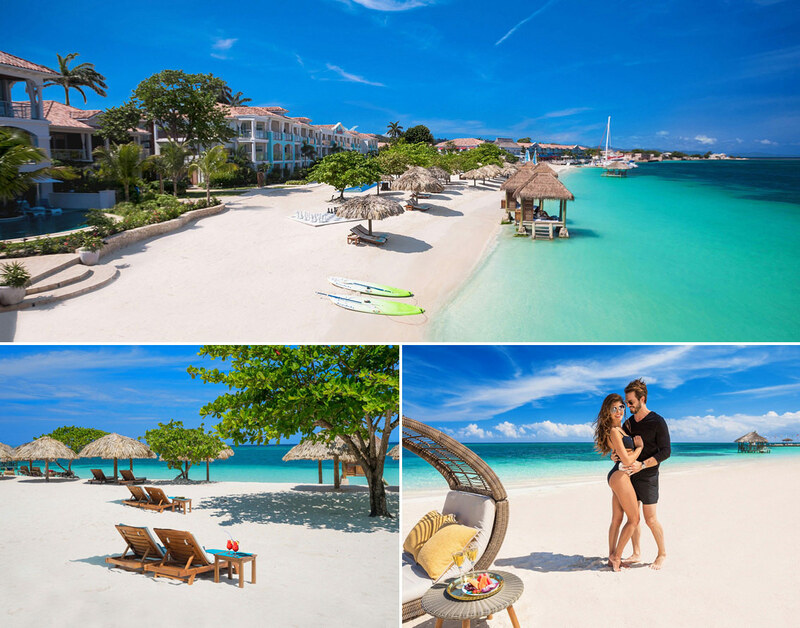 Sandals Montego Bay is one of the island's most playful and captivating hideaways set along the best and most exclusive white-sand beach in Jamaica, where offshore reefs create the calmest waters for leisure swims. 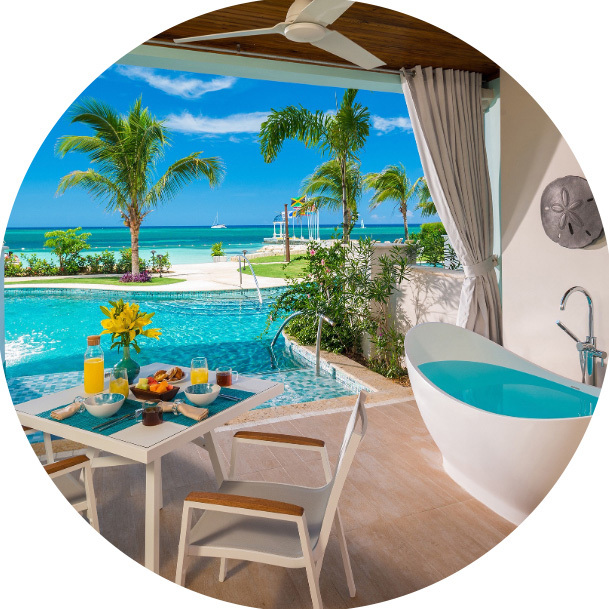 Swim right up to your room in these magnificent Love Nest® Suites that are redefining the standard of luxury along Jamaica’s best and most exclusive white-sand beach. Everything is just steps away, including direct access to a crystal lagoon pool from your oversized patio. Relax on a private lounge chair in the water, or retreat to the airy master bedroom, featuring a Tranquility Soaking Tub™, separate living space, fully-stocked bar, and spa-style bathroom. Plus, these romantic suites feature the attentive services of a personal butler to take care of your every wish. Jamaica's old-world charm meets modern interpretations of beachfront luxury in the all-new Beachfront Millionaire Butler Suites. Ideally located mere steps away from one of Jamaica's most exclusive white-sand beaches, these chic villa suites have been completely reinvented to put the Caribbean Sea within reach. A retractable glass wall lets you enjoy unobstructed ocean views from the comfort and seclusion of your suite, or take in the breathtaking views from an oversized balcony with Tranquility Soaking Tub™ for two. Experience the most uniquely intimate retreats offering the ultimate in privacy where you and your loved one can share unforgettable intimate moments. The Romeo & Juliet Butler Villas offer the utmost in luxury and privacy with a secluded terrace with private plunge pool, separate living space and bedroom, a lavish spa-style bathroom, and outdoor Tranquility Soaking Tub™ - all accompanied by the attentive services of a personal butler. Just steps from Jamaica's finest white-sand beach, the new Palms block boasts all-new suites that redefine beachfront living – showcasing the very best in island-inspired décor and luxurious amenities. Grand master bedrooms, stylish furnishings, lavish spa-style bathrooms, and over-sized terraces and balconies with private Tranquility Soaking Tubs™ overlooking serene reef-protected waters create a world centered on true romance. A global team of master chefs caters to your endless culinary cravings in stunning settings that are on-the-beach casual or white-gloved chic, your food mood-of-the-moment is always covered and always included! Just steps from Montego Bay’s pristine white-sand beach, Latitudes° Over Water Bar offers the perfect place to sip sunset cocktails from its prime location overlooking turquoise waters. Enjoy the stunning 360° ocean views while lounging on a hammock suspended above crystal clear waters or gather around the intimate fire pits. an open-air concept that showcases amazing ocean views from an extended deck with fire pit. UNLIMITED PREMIUM SPIRITS Are Included and Served Everywhere Throughout the Resort at No Extra Cost. Sandals Montego Bay’s all-new Over-The-Water Serenity Chapel is located near the Latitudes Bar, directly across from the newly renovated cottages. This intimate wedding venue features a Bell Tower and seats up to 40 guests. Featuring our signature glass floor aisle, Riverstone altar, and open-air design, this exquisite chapel takes advantage its beautiful, natural surroundings to bring you closer to the water on your special day. The updated wedding chapel features a brand new path framed by pools with fountain features, freshly painted interiors and exteriors, and new lighting. Choose from up to 21 Restaurants & More! You'll recognize the extent of our latest innovations the moment you step into the new lobby.